Interim WBA junior featherweight champion Scott Quigg dished out a long and painful beating to the very game Japanese challenger Hidenori Otake, 22-2-3-(9 Kos), over twelve rounds. Otake was a virtual enigma coming into the bout but proved to be a durable and competent opponent. Quigg buzzed Otake several times throughout the bout, most notably in the ninth round, but could never really come close to stopping the challenger. Otake’s face was a groteque mask after the bout, as he suffered massive swelling and two severe cuts. With the win, Quigg did his part to make a possible showdown with fellow 122-pound champ Carl Frampton a reality. James “Chunk” Degale, 20-1-0-(14 KO’s), made his case as a legitimate threat to anyone in the Super Middle Weight division by becoming the first fighter to stop Mexican veteran Marco Antonio Periban, 20-3-1(13 KO’s). Degale looked to test Periban’s resolve early by coming out extremely quick and tagging the Mexican with several big punches in the first two rounds. After meeting little resistance Degale pounced on Periban in the third round and dropped him as the result of several huge left hands. The ref stopped the bout immediately in what could be deemed a premature stoppage—although the result seemed academic. Degale is now the manditory for a shot at the IBF title and called out reigning champ Carl Froch in the post-fight interview. Former world title challenger George Groves, 21-2-0-(16 KO’s), overcame a sluggish start to halt American fighter Denis Douglin, 17-4-0-(10 KO’s), in seven rounds. Groves looked extremely vulnerable in the early stages of the bout, getting tagged with several big shots and suffered a cut on his nose. A combination of Groves finding his groove and Douglin getting fatigued caused the bout to dramatically shift towards the Englishman’s favor. A sharp combination by Grove’s dropped Douglin hard in the seventh round and the stoppage came in the follow up barrage. Despite the win, it was a very mediocre showing from Groves, who might be wise to take a well-needed break after such a dramatic year in the squared circle. In a frightening display of speed, punching power and raw athleticism 2012 Olympic super heavyweight gold medalist Anthony Joshua, 10-0-0-(10 KO’s), obliterated fading veteran Michael Sprott, 42-23-0-(17 KO’s), in just 68 seconds. Joshua stunned Sprott with a pair of straight right hands and then unloaded a barrage of power punches that forced the referee to stop the fight. It was another quick and brutal display for perhaps the most interesting prospect in boxing. 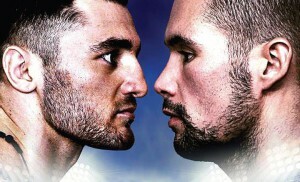 In the long anticipated rematch between bitter rivals, Tony Bellew got his revenge by winning a sloppy but at times exciting split-decision over Nathan Cleverly. Cleverly threw the better punches early but often missed the target against the defensive minded Cleverly. Cleverly probably held a slim lead over the first half of the bout by using an active jab and keeping Bellew off rhythm. The fight began to shift in round eight when Bellew finally broke through with some serious power punches. Bellew seemed to stun Cleverly in the ninth round with a left hook and as result Cleverly, who was utterly exhausted, spent the remainder of the fight pinned against the ropes in survival mode.